Wood Badge will be conducted during a week long session (Mon-Sat, June 17-22, 2019) at Camp Fleischmann. Registrations will be accepted on a first-come first-served basis until the course reaches capacity; alternates will be placed on a wait list. Fee $275 - Provides for all instruction materials, food, and special equipment. Registration and deposit ($50) are due with application. The full fee must be paid on or before May 17, 2019. Contact Course Director Brad Mahler, wbnac2019@gmail.com, with any questions. Early on, Baden-Powell realized he needed to create a practical training for adult leaders. On September 8th, 1919, Baden-Powell held the first Wood Badge course seeking to deliver a hands-on training experience for scout leaders. Since then, thousands of Scout volunteers around the world have participated in the course created 95 years ago. Participants get hands-on experience in how to lead and develop leadership within the communities that they serve. You will gain insights into the Scouting program, team development, and working with different people. Not only will you become a better leader in Scouting, you will be able to apply these practical leadership skills in your work, service, and other endeavors. 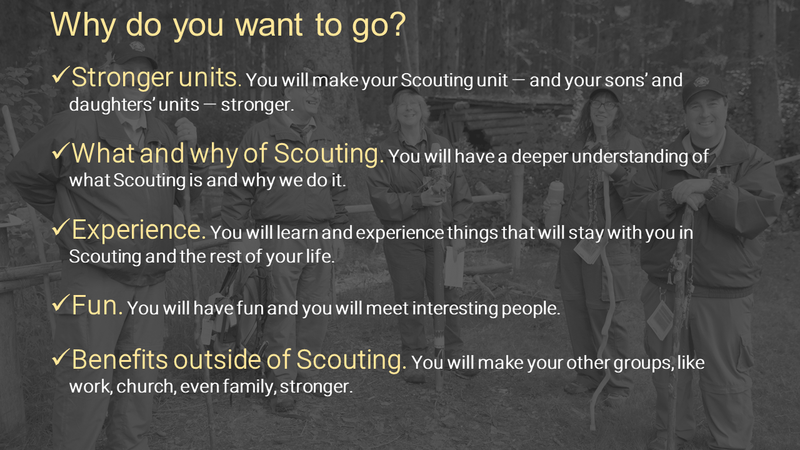 Experience firsthand how Scouting units are formed and run. Share in fun and adventure while making new friends. Whether you have never camped before or have more than a 100 nights on the trail, Wood Badge is for you. What is Wood Badge? Wood Badge is the premier leadership course for all adult Scouters. Who goes to Wood Badge? A registered and trained adult leader, 18 years of age or older, in any area of Scouting. Why should I attend Wood Badge? As a participant, you will take part in many presentations, discussions, and activities that explore a wide range of leadership methods and tools. A key area of discovery is team development. By recognizing the stages through which teams evolve, you will learn to apply leadership strategies that enable teams to reach their highest level of performance. When and where is Wood Badge? W3-329-19 will be held on June 17-22, 2019. The course will be held at Camp Fleischmann. What is the ticket? There are two parts to Wood Badge training: the course and the ticket. While on course, you will establish a set of personal goals relating to your Scouting position. This is your ticket. Accomplishing these goals allows you to apply and practice the skills learned on course. After you have completed the course and your ticket, you will be awarded your Wood Badge beads. What do I need to register for Wood Badge? Be 18 years of age or older and registered in the Boy Scouts of America. Completed position-specific basic training for your registered Scouting position, including any required outdoor skills training. Register online. Have a current BSA Annual Health and Medical form, signed by a doctor within one year of the last day of the Wood Badge course. The themes that follow encapsulate the course content of Wood Badge. Wood Badge has been developed for Cub Scout, Boy Scout, Venturing, and Exploring leaders, as well as Council and District leaders. Its focus is on leadership, not out-of-door skills. The following information is designed to provide you with key course information. It would be difficult and most likely confusing to simultaneously model Cub Scouting, Boy Scouting, Venturing, and Exploring in one course. What is a Wood Badge Ticket? During the years preceding Scouting, British soldiers who were stationed overseas had to earn their passage or ticket home after their term of service was complete. This is why it is called a TICKET, but just what is it? A ticket is a contract between you and a member of the staff usually referred to as a Troop Guide or Ticket Counselor. This contract is your commitment to practice using the Leadership Skills taught at Wood Badge in the performance of your Scouting position.